30 Sep What Does the Connecticut Debt Relief Agent Case Mean for Attorneys? Recently the U.S. District Court in Connecticut ruled that parts of the revised Bankruptcy Code were unenforceable. (See "Federal Court Strikes Down Bankruptcy Code Provisions") But some parts of the case remain undecided. While the Court decided that attorneys not engaged in the practice of bankruptcy law did not have to comply with certain provisions of the act, the Court did not decide the applicability of the moniker "Debt Relief Agent". The Court also never once mentioned the sole consumer who was a plaintiff in the case and what effect the statute had on her rights as a consumer. You get your bankruptcy discharge, try to re-finance your mortgage, and are told you do not qualify because of a debt or debts still on your credit report. How can this be? Carmen Dellutri has blogged on this issue. It is called zombie debt, debt that will not die. There are many companies which buy bad debts, for pennies on the dollar, so if they collect on a few of them, they still make money. The cheapest way to collect is to put that debt on your credit report. The debt is re-inserted, under the name of the zombie debt buyer. No expense for mail or phone calls. The bottom feeding debt buying companies are waiting for you to re-finance, figuring your back will be against the wall, you will pay them to keep the mortgage deal, as there will not be enough time for your lawyer to get relief in court. 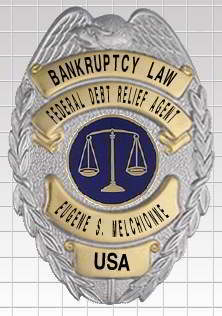 Lawyers filed a class action, heard in California, for all people who had bankruptcy discharges. Most people who have filed bankruptcy have zombie debt on their credit report. This blog is about Debt. Our leaders in Washington are about to strap us with a bucket load of debt. Debt that will be with our grandchildren, even though the Government anticipates making a profit. Make no mistake there will be a bunch of arms twisted, and We Will Have A Bailout Bill soon. The question is how are they going to sell it to the American Public? Yesterday's historic vote was a perfect example of how the Spin (Bush) Administration will sell the deal. What a difference a day makes: Yesterday's activities in Washington directly impacted the stock market to the tune of a 777 point drop. In a consumer bankruptcy case, sometimes the trustee will request, or even demand, that the debtor amend the schedules based upon the trustee's opinion that something has been omitted, or that something is incorrect. Usually, the trustee is right and the debtor makes the amendment. After all, the bankruptcy schedules are complicated and contain a great deal of information, just like other important legal documents such as income tax returns, and it is easy for something to be overlooked by the debtor. It is a rare bankruptcy petition that is filed with the court in perfect form, with no possible omissions and no corrections to be made. Sometimes, however, the trustee's request that the schedules be amended should be politely declined. This might happen when the trustee's request is based upon an erroneous interpretation of the law, or when the trustee's request is made to gain an advantage in litigation. For example, in a case filed by a married debtor which does not include the spouse, the trustee will sometimes ask that that the schedules be amended to include the assets of the non-filing spouse. This would be incorrect in a non-community property state such as Minnesota, because spouses do not automatically own one another's property in such states. Because the bankruptcy schedules are sworn statements, such a wrongheaded request should be refused, because to comply would amount to filing a false statement with the court.